Afternoon of May 27th, approved by the Central Committee, organized by United Front Work Department of CPC Central Committee and the National association of industry and commerce, the national television report on ideals and beliefs of the younger generation of private entrepreneurs was held in the Beijing Great Hall of the People. The report was held in the form of a teleconference, set up sub-venue in the provinces and cities, six young people on behalf of national private entrepreneurs made speech. 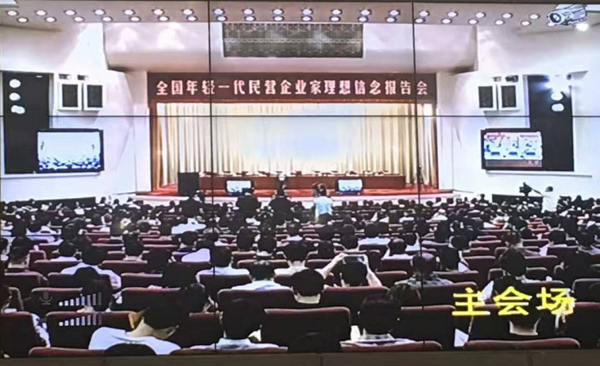 Yu Zhengsheng, the Member of the Standing Committee of the Political Bureau of the CPC Central Committee and chairman of the CPPCC National Committee attended and made important speeches. The meeting was chaired by Sun Chunlan, the Minister of the United Front Work Department. The report of Jining branch is located in No. 1 conference room on the third floor of Jining communication building, Jining Chamber of Commerce and Industry, Ethnic and Religious Affairs Municipal Bureau Li Kexue, Municipal Federation of industry and commerce vice chairman Jiao Jundao and other leaders and members of the Municipal Federation of industry and Commerce, Municipal united front department economic department, City Federation of Industry and Commerce cadres, Executive Committee of Jining Provincial Federation of industry and Commerce, the person in charge of the Chamber of Commerce and the city's key business executives listened to the meeting together. 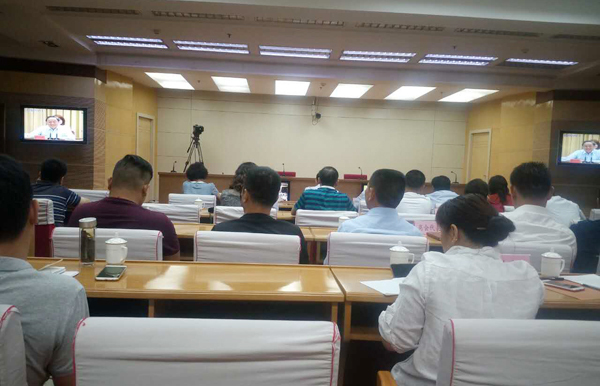 As Jining City Federation of Industry and Commerce executive director of the unit, the unit Jining General Chamber of Commerce vice president, China Transport Group was invited to participated and Group deputy general manager Guan Chenghui on behalf of the Group attended. The meeting through television focused on further strengthens the importance of educational practice activities of the younger generation of private entrepreneurs ideal and beliefs in the country. At the meeting, six young entrepreneurs on behalf of national entrepreneurs made business representative speech on independent innovation, leading the team arduous pioneering. The meeting pointed out that in the current situation, put forward higher requirements for entrepreneurs arduous pioneering, more arduous task, so must be unify thinking, raise awareness, earnestly study and implement the spirit of the Party Central Committee, around the center, the overall situation, firmly grasp the overall tone of the work with steady progress, key work is continue to work hard, full play the role of local Federation of Industry and Commerce Chamber of Commerce initiative, strengthen supervision and guidance, summed up good practices, good experience and promote them, timely study and solve new business development situation, new problems, let private economy glow with greater passion and vitality. China Transport Group as a modern science and technology large-scale private enterprises, with the strong support of all levels of government, with the responsible for the country community, responsible for the customer, responsible to the staffs and the corporates, make solid foundation, After 23 years' development to achieved double harvest on the economic benefits and social benefits. Currently, the Group have made outstanding achievements in the e-commerce, cross-border e-commerce, intelligent agriculture, intelligent logistics, high-tech service outsourcing, intelligent equipment manufacturing and other industries and fields, and praised by a number of national and provincial and municipal leaders. China Transport Group is a large diversified industry Group integrating intelligent terminal manufacturing, e-commerce, software research and development and intelligent logistics. It is supported by the Ministry of Commerce, Ministry of Industry and Information Technology Development and Reform Commission and is key supported by Shandong Province and Jining City. Group have honors of MIIT e-commerce innovation pilot enterprises, MIIT brand pilot enterprises, Abiding By Contracts and Keeping Promises Enterprise, China's outstanding enterprises of Internet e-commerce industry, Shandong e-commerce cognizance enterprise, Shandong e-commerce demonstration enterprises. In the future, the Group will actively implement the spirit of the Party Central Committee, full play the younger generation of private entrepreneurs' forge ahead, pioneering and innovative spirit of entrepreneurs, with e-commerce, cross-border e-commerce, logistics, intelligent manufacturing, leading with software development to the diversified development pattern, and write a new chapter of China Transport Group glorious with resplendent people unremitting efforts!